20 Dec :With the country facing increased terror threat, PM Manmohan Singh regretted that modern technology is not adequately utilised to meet the challenge and pitched for greater focus on scientific developments for securing the nation better. Pointing out that other countries have used technology for security with great effect, he favoured work in the areas of surveillance systems, cryptography, real time search and identification from distributed large databases and computer simulation exercises to enhance crisis tactics and responses. "The role of technology in supporting our counter terrorism and internal security efforts is, I believe, not adequately appreciated," he said at a function in New Delhi on Saturday to give away the Shanti Swaroop Bhatnagar Prizes to 21 young scientists. Investment in security technologies is vital if the country’s security systems are to keep pace with the increasing sophistication of international terrorism and crime, he said. structures with great effect. It acts not only as a force multiplier but can also provide solutions to human problems relating to command, coordination and communication." The Prime Minister’s emphasis on utilisation of modern technology significantly comes in the midst of government’s efforts to revamp the security structures of the country in the wake of Mumbai attacks. The government has already spelt out a slew of measures to meet the increased terror threat from land, sea and air. "We cannot be satisfied becoming a back office for providing research and development solutions for multinational companies," Manmohan Singh said a gathering of top scientists in New Delhi on Saturday. 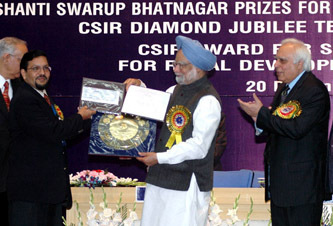 Singh gave away the Shanti Swarup Bhatnagar Prizes, the country’s highest science awards, for 2007 and 2008 to 21 young scientists. "China and Japan have scored over India in delivering to the people the benefits of scientific and technological advances," he said. "Unless we apply ourselves to this task, the powerful scientific tools of social and economic change will remain confined to our laboratories and institutions," he said. "Our scientists should work to commect science to the daily lives of millions of Indians," the Prime Minister said pitching for use of public-private partnerships to commercialise technologies emerging from R&D programmes being funded by various science departments. He said the scientists should focus more on linking the lab with the market and asked Council of Scientific and Industrial Research (CSIR) to take lead in this regard. "To begin with, let CSIR work to commercially exploit its knowledge base, currently embodied in more that 3000 or so patents held nationally and globally," Singh said.